The Orange River, or Gariep, is one the continent’s great rivers. Gravity Adventures has explored her waters from source to sea and picked the best three sections for our legendary rafting trips. The Maluti Meander is fast flowing and vibrant. 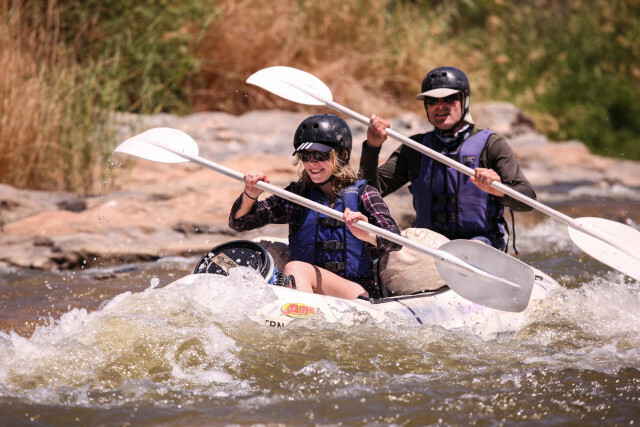 The Raap en Skraap section offers easy-going desert rafting – amazing mountainous scenery with the tree- and reed-fringed river providing an oasis. Suitable for all ages and usually run as a three-day, four-night trip. The Orange River Gorge is the jewel in the river’s crown, offering a combination of all that makes the ultimate rafting trip: awesome desert scenery, including the second highest falls on the river; fun white water and a couple of bigger rapids to get the adrenalin flowing; manageable distances so you can enjoy camp time and, best of all, we are the only operators on this section so it never feels crowded. Minimum age of 8 years recommended, younger children by arrangement. ‘Upgrade’ trips offer a more luxurious experience – smaller groups (max 12); guest house accommodation; sit-down dinners with wine; porter boaters. We also offer sea kayaking, tubing, coasteering and white water kayaking. Join Gravity Adventures and feel the force of nature!